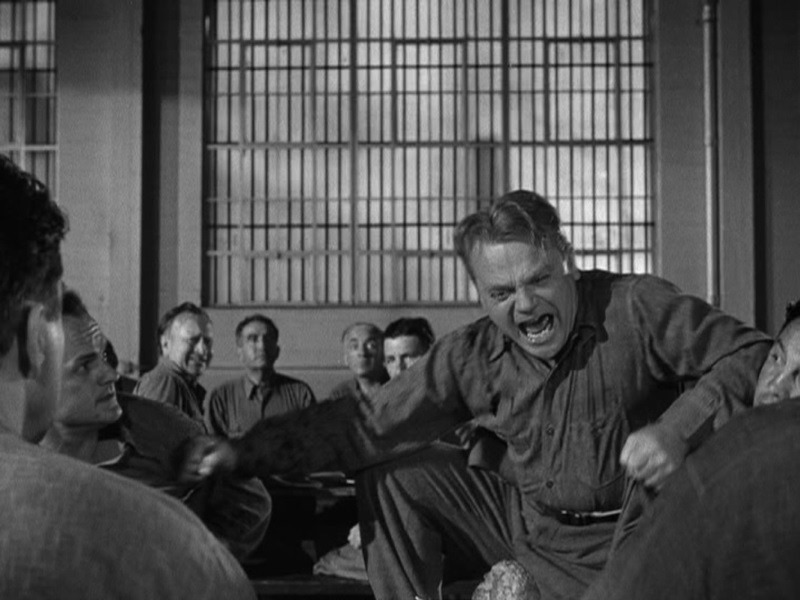 Cagney’s performance, one of his very best, draws a good deal on speed. The actor makes his own quickness into an embodiment of the character’s impulsiveness, of his need to act, regardless of consequences. As a result, we get a picture of a man who not only “didn’t have time to think,” but also has a misplaced faith in the rightness of his own nature. 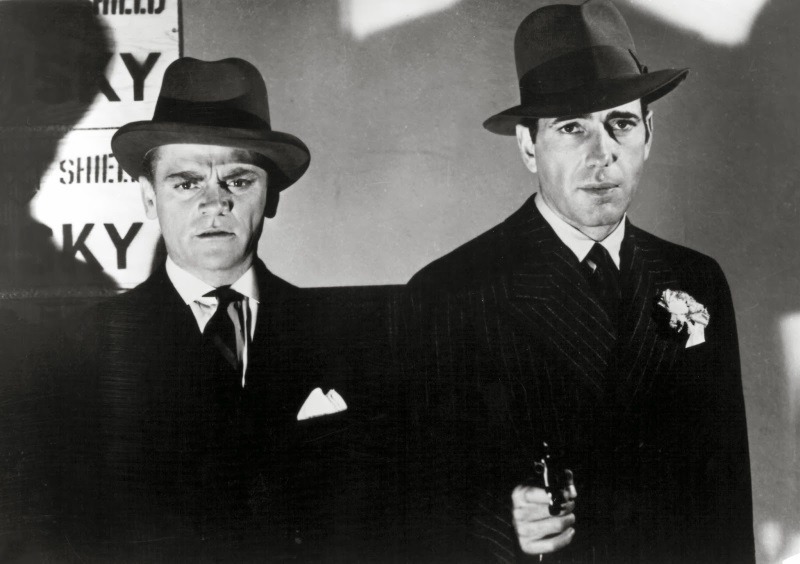 This is implicit in most of Cagney’s performance, but it is neatly dramatized for us in an intriguing confrontation between Cagney and Humphrey Bogart (as the thuggish George Hally). The two are competing bootleggers at this particular point, but now a deal is in the air. 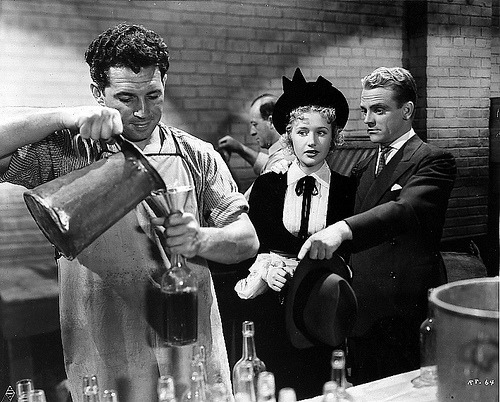 Talking of possible repercussions, Bogart/Hally tastes the whiskey they’re dickering over, but Cagney merely rubs it on his hands and sniffs them impatiently. “I’m in too much of a hurry to worry about somebody getting sore at me,” says Cagney/Bartlett, and they plunge into a partnership which will lead to their own deaths as well as those of others. The behavioral contrasts of the scene make for a quintessential comparison of Cagney and Bogart as actors, but they also reflect the tragic flaws of a visceral, unreflective dynamo named Eddie Bartlett. 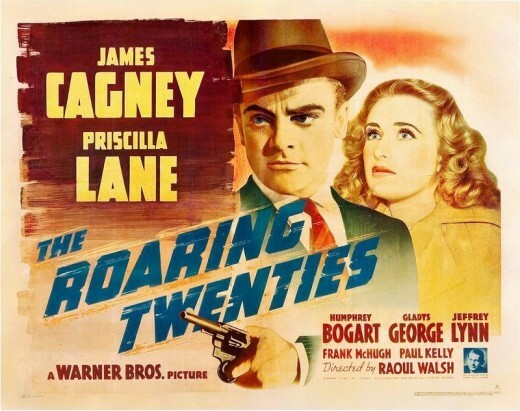 The Roaring Twenties is richer is emotion than any other Walsh film I know of, and much of the credit must go to Cagney; emotionally, this may be the actor’s richest performance as well. It’s a movie full of sentiment, with “Melancholy Baby” setting the mood in a way that parallels the importance of “As Time Goes By” to Casablanca. But the sentiment is frequently underplayed to one degree or another, and part of the film’s considerable emotional power comes from a sense of how much sentiment the characters, and Bartlett in particular, are holding back. The role of Eddie Bartlett calls for some familiar Cagney moves—the bantam Irishman with that “touch of the gutter,” and the oddly likeable gangster—and yet the characterization has a paradoxical tenderness to it also. An early reunion scene between Bartlett and an old pal, a draft-dodging taxi driver played by Frank McHugh, is a resonant and incisively nuanced essay on that specialty of American movies, male friendship. The scene is stronger on comedy than on realism, but Cagney and McHugh give an authentic inflection to a warm, tenuous, abruptly renewed relationship. But tenderness of another sort appears as Eddie Bartlett heads toward destruction. Confronted with Jean’s affection for someone else, Cagney’s Bartlett conveys not just a sense of hurt, but also a self-effacing stoicism and a willed generosity which is both a gesture of love and of abnegation. Later, the alcoholic Bartlett pauses blearily to contemplate a barroom piano player’s version of “Melancholy Baby” and Cagney evokes a bewilderment and a hint of grim amusement that work against the self-pity inherent in the scene. And when Bartlett finds himself tabbed for death at the end, Cagney looks down at the pointed gun with a forlorn humor that sums up the sense of waste and futility that has hovered over him through most of the film. A similar aura of well-worn futility trails Gladys George’s Panama through the film, too. But while her voice has the sound of cigarettes and whiskey and her eyes are full of tattered emotions, she has the durability and self-knowledge that Eddie lacks. Here too the film perhaps collides with aspects of American myth: the male “failure” destroys himself, the female “failure” endures. In any event, one more facet of Eddie’s tragedy is that he is so consistently oblivious to Panama’s saving strength. Here as in What Price Glory? the narrative’s path of destruction is countered in part with digressions that dwell on physical pleasures. Food and drink have their moments of relevance—watery lemonade in Mineola for the first unmasking of Eddie’s “dream girl”; a gangster (Paul Kelly) digging into a plate of spaghetti as he waves off Eddie’s business overtures. Walsh’s beloved drunks turn up frequently, but none more memorably than the potted soul who is the only other visible passenger as Eddie accompanies Jean home on the late train to Mineola: he gets up very purposefully when they get off, staggers toward the exit of the now-empty car, plops back down again in the very seat just vacated by the couple. His comic futility adds irony and pathos to a scene which is both “romantic” and heartbreakingly bleak. And in the previously mentioned Cagney-McHugh reunion scene, period detail and ribald comedy converge neatly: Danny Green (McHugh) puts a souvenir German helmet under his bed (“…so no one will cop it”) and Bartlett—without mentioning chamber pots or spittoons—silently persuades his pal that it might be best to turn it over, just so there’s no confusion about its purpose. At such moments, Walsh’s people transcend studio expressionism to take us inside the ambience of an era and a milieu. The final line of The Roaring Twenties has a prominent place in American movie folklore, but it is also part of a better scene than its fame and reputation suggest. Panama’s “He used to be a big shot” is obviously meant above all to be a moving epitaph for Eddie Bartlett, and it certainly works that way. But it is also the kind of line whose significance expands in retrospect. The final setting, a church’s snowy steps, suggests that the concluding moment will be sentimental and moralistic, but given the utter lack of religiosity in the film up to and beyond this point, the church setting is conspicuous for its lack of relevance. “He used to be a big shot,” in turn, suggests a multitude of possibilities, none of which have any particular religious significance. For Panama, the line is an expression of her sympathy for Eddie, a sympathy complicated by her own regrets and disappointments, and it is also her attempt to identify Eddie (for an inquiring policeman) in a way that does some justice to a human being who has just fallen dead in a cold street. And yet, in this movie about self-understanding and the lack of it, it is significant that the touching epitaph does not seem entirely accurate. While Eddie’s big-shot days are surely behind him, his decline has more to do with mistaken love than with any twist or turn of his business career. And in neither case, before or after the decline, is the “big shot” a key to his character. Rich or poor, he is essentially a working-c1ass survival artist (one early sequence in jail even has him earnestly chiding a fellow prisoner for “silly notions” about suicide), and it is a breakdown in a trickier realm—human emotion—that does him in. Bartlett “used to be a big shot,” but that doesn’t explain him any more than “Rosebud” explains Charles Foster Kane. The comparison is by no means inappropriate: both men’s careers have their mysteries, their inexplicable shifts in style and mood, and both in their separate ways are fascinating examples of what seems to be an American type: the sensitive man of action whose life is wrecked by ignorance of his own emotions. The Roaring Twenties is neither as spectacular nor as complex as Citizen Kane, but it remains a much better film than its neglect in the history books would seem to indicate. One can imagine a Fifties version which might have given us deeper characterizations of Jean and the lawyer she marries, or a Seventies version which would emphasize the corruption of the age. But while it is a less than perfect film, it is a sign of the movie’s seriousness and integrity that even seemingly extraneous details reflect ironic light on its lowbrow version of the tragic hero (“Well, Lefty, how does it feel to be a stooge?” “Aw, boss, I don’t mind.”). At the very least, The Roaring Twenties is a fortuitous convergence of moviemakers suited to get the most out of Hellinger’s story and the screenplay by Richard Macaulay, Jerry Wald and Robert Rossen: Warner Brothers with its tough-guy stock company and its expertise in gangster films, Cagney with his energy and his knowledge of the unglamorous New York, Walsh with his flair for lowlife and violence. High Sierra strikes me as rather overrated. The Bogart vogue is perhaps largely responsible for its reputation, and its position as a gangster film reflecting on the aging and decline of the genre’s materials gives it a deceptive maturity. But Roy Earle’s mixture of battle-scarred toughness and misguided sentimentality never quite comes into focus, since Bogart seems to lack the kind of range that permitted Cagney to make some sense of Eddie Bartlett’s contradictions. Bogart seems too hard-edged and intelligent to get all wrapped up in a sweet young thing like Velma (Joan Leslie) and too urban and nocturnal to yearn for any “Indiana farm.” The Ida Lupino character’s dog, part symbol and part melodramatic annoyance, plays far too ominous a role in what is at least trying to be an actionful character study. Moreover, the final anguished query of Marie (Lupino)—”What’s it mean when a fella ‘crashes out’?”‘—makes little sense at the nitty-gritty level since she and Earle have discussed the term earlier. Perhaps she is supposed to be in shock; but if so, the scene makes even less sense. Still, it’s often an appealing film and its misfires seem more those of attempted innovation rather than of strained seriousness. In the final sequence, for example, Bogart is frequently seen from vast distances, a small figure against an imposing and indifferent landscape. At the moment of death, he is seen from far above and we share the rifleman’s point of view. These are markedly unheroic shots from a reputedly heroic director, but this memorable sequence comes off more as a set-piece than as the consummation of the movie’s view of things. Jerome Cowan’s reporter provides a snide and unreliable commentary on the climax and yet here too the issues fail to emerge as pungently as they do in an analogous situation with Edmond O’Brien in White Heat. “Doc” Banton (Henry Hull) has a famous line, supposedly a quote from “Johnny” Dillinger, about “rushin’ toward death,” but it emerges in a moment so portentously literary that old Doc almost seems possessed of a desire to dictate his memoirs to Earle. But “rushin’ toward death” is beautifully expressed elsewhere in the film: Big Mac (Donald MacBride), a fatally ill gang chieftain, goodhumoredly asks for some of the whiskey he’s been ordered to avoid: “I don’t know,” says Earle; “I do,” says Mac, with a grin and a hurry-up motion. Doc Banton’s most interesting moment comes elsewhere, in his frankly professional preoccupation with fees: “I think I oughta get $500 for this. I’ve been takin’ a big risk.” There are other special moments. “Red” (Arthur Kennedy), a smalltimer who thinks he’s on the verge of the big time, chatters with poignant idiocy about a bunch who got caught when their getaway car was snitched. And in the final car chase, Bogart gives fleeting form to Earle’s grim, unflinching recognition of what’s about to happen to him. Socially and psychologically, the Federal agents in White Heat adopt an air of cool selfrighteousness, but the film’s ferociously uncivilized energies form its largest and most convincing appeal. One index of the film’s mystique is “Big Ed” (Steve Cochran), a flashily brutal gangster who makes unexpected claims on our regard when he asserts he’d rather meet Jarrett head on than spend the rest of his life running away from him. Another is Verna (Virginia Mayo), Jarrett’s wife, who is coveted by both Jarrett and Big Ed even though her glamour fails to conceal her fundamental crassness. Cochran’s code and Mayo’s odd importance to her men each reflect a sweeping imperviousness to the comforts of more conventional living and a radical alienation from anything like romantic love. Like Jarrett, Big Ed and Verna both reflect titanic compulsions that lead through darker passions to forms of life utterly beyond the “normal” world of the 20th century. The movie’s convoluted Dionysian undercurrents also appear in some of its more deliberate wrinkles. At one point, Verna spits out a wad of gum just before kissing Jarrett, thus echoing Big Ed’s earlier gesture with her on the receiving end. This intimation of role changes and sexual gamesmanship also turns up in Jarrett’s relationship with an undercover agent (Edmond O’Brien) who has earlier made the claim that a certain criminal “would know me in the dark” and who becomes something of a surrogate mother to Jarrett. But the film’s erotics are largely thwarted: Jarrett’s environments are often forbiddingly metallic, and it is very much to the point that most of his really intimate conversations have to be conducted in a whisper. In the end, the police humorlessly disregard yet another attempt at seductive sell-out by Verna, and the O’Brien character’s dismay when Jarrett proves almost impossible to kill (“What’s holding him up?”) suggest a tragic and mutually destructive schism between eros and civilization. Cagney himself evokes a strong link between death and sensuality, especially in the final scene. 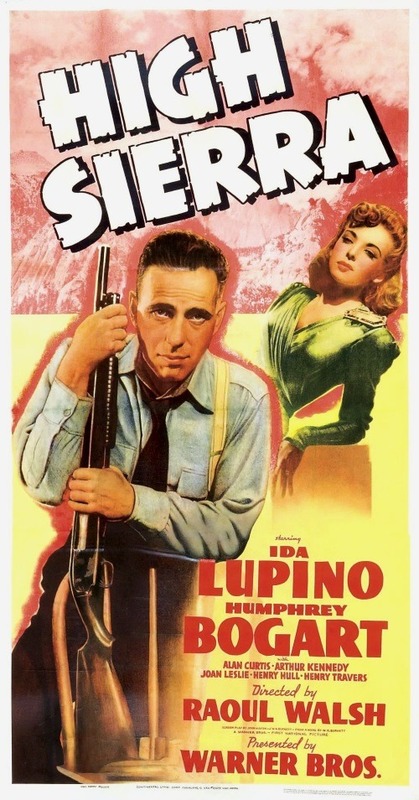 Several Walsh films of this period (Pursued, Colorado Territory, White Heat, The Enforcer, Along the Great Divide) have a psychological bitterness which is missing from his previous films, including even the more despairing dramas (What Price Glory?, The Roaring Twenties, High Sierra and Manpower). This perhaps reflects a postwar shift in Walsh’s outlook, although it surely has something to do with a contemporary Hollywood vogue for psychoanalysis, too. But while this psychological element might seem to “deepen” Walsh’s movies, his approach in fact remains much the same. The director focuses on Cody Jarrett’s energy here much as he did elsewhere with Eddie Bartlett and Gentleman Jim Corbett. All other characters and themes tend to get secondary status at best. In White Heat, this creates a troublesome imbalance: Jarrett is hot and the Federal agents are cold, but does that justify making Jarrett the only character with any inner life? One can argue that the agents’ robotlike behavior is based on their lack of “inner life,” but such an argument only leads us back to the problem of superficiality. The chief agent (John Archer) does have a revealing moment: when he gets a break in the case, he twists a suspect’s death mask in his hands and growls with pleasure, “And I thought you were never going to talk, baby!” “The Trader” (Fred Clark), the brains behind Jarrett’s gang, also gives us a glimpse of oversized, dehumanizing power in his glibly innocuous revelation of his true identity: “Daniel Winston. San Diego. Securities.” But the difficulty is best seen with Hank Fallon (O’Brien). He is an agent whose specialty is infiltration of the criminal world via the prison system. Here, he not only assumes a fictitious criminal identity, he also forms an intimate relationship with Jarrett and then, when the time comes, shoots him several times with a high-powered rifle. The only glimpse we get of Fallon’s personal life is fairly conventional (he enjoys “the eternal struggle between man and fish”), but neither the movie nor Edmond O’Brien’s flabby performance gives us any idea of what kind of human being is involved here or of what the human cost of such radical shifts of identity and emotion might be. Consequently, White Heat lacks the dimension and context which richen the central energies of What Price Glory?, The Roaring Twenties and Gentleman Jim. And in this “psychological” period, Colorado Territory is probably the most wholly satisfying Walsh film. 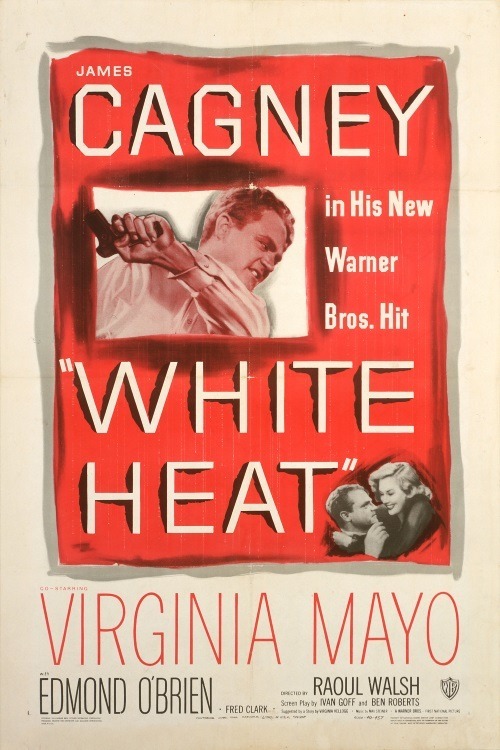 But White Heat is blessed with one of Cagney’s most galvanic performances. And its concluding ball of flame, besides being the ultimate expression of the energy of Walsh’s most unreflective heroes, is one of the few convincing manifestations of larger-than-life emotion that the movies have created. The players: James Cagney (Eddie Bartlett), Humphrey Bogart (George Hally), Jeffrey Lynn (Lloyd Hart), Priscilla Lane (Jean Sherman), Gladys George (Panama Smith), Frank McHugh (Danny Green), Paul Kelly (Nick Brown), Abner Biberman (Lefty), Joseph Sawyer (Sgt. Pete Jones), Ed Keane (Pete Henderson), Elisabeth Risdon, George Meeker, Bert Hanlon, John Deering (narrator). Warner Brothers, 1941. Screenplay: John Huston and W.R. Burnett, after the novel by Burnett. Cinematography: Tony Gaudio. Art direction: Ted Smith. Editing: Jack Killifer. Music: Adolph Deutsch. Production: Hal B. Wallis; associate: Mark Hellinger. The Players: Humphrey Bogart (Roy Earle), Ida Lupino (Marie Garson), Alan Curtis (Babe Kozac), Arthur Kennedy (Red Hattery), Joan Leslie (Velma), Henry Travers (Pa Goodhue), Elisabeth Risdon (Ma Goodhue), Donald MacBride (Big Mac), Henry Hull (“Doc” Banton), Barton MacLane (Kranmer), Cornel Wilde (Louis Mendoza), Willie Best (Algernon), Jerome Cowan (Healy), John Eldredge (Lon Preiser), Minna Gombell (Velma’s mother), Paul Harvey (her husband), Isabel Jewell, Arthur Aylesworth, Spencer Charters, Robert Strange, Wade Boteler, George Meeker, Harry Hayden, Eddie Acuff, Garry Owen. Warner Brothers, 1949. Screenplay: Ivan Goff and Ben Roberts, after a story by Virginia Kellogg. Cinematography: Sid Hickox. Art direction: Edward Carrere. Editing: Owen Marks. Music: Max Steiner. Production: Louis F. Edelman. The players: James Cagney (Cody Jarrett), Edmond O’Brien (Hank Fallon/Vic Pardo), Virginia Mayo (Verna), Steve Cochran (Big Ed), Margaret Wycherley (Ma Jarrett), John Archer (Evans), Wally Cassell (Cotton), Paul Guilfoyle (Roy Parker), Ian MacDonald (Bo Creele), Robert Osterloh (Tommy Riley), Fred Clark (The Trader), Ray Montgomery, Mickey Knox, Pat Collins, Fred Cobey, Ford Rainey.